Planning a great Prom idea? 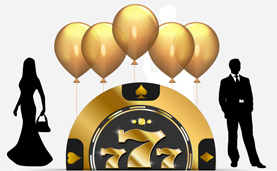 Try a Casino Theme Prom Party with BAM Casino Parties for your next high school prom event? We put an extra special care and attention into each corner of the event space while organizing a casino themed prom party in San Fransisco Bay Area.With BAM Casino Parties, we plan a prom that wows with a latest and most popular promenade themes/trends to create a super-customized ball that fits within your school or group’s budget. Entertain your prom guests with quality casino party fun. If you can’t go to Vegas let us bring Vegas to you! Get out those cards and chips! It’s time for a Casino Night Prom ♥️– a sure hit with every student who loves games. We have everything you’ll need for a Casino Prom. = 7 Units w/8 Pro Dealers and 1 Casino Mgr. 1 x Casino Manager =14 Units w/16 Pro Dealers and 1 Casino Mgr. Order A La Carte! Create your own custom package to meet your specific budget needs. Call and speak with a event specialist today. 1 x Casino Manager = 5 Units w/5 Pro Dealers and 1 Casino Mgr. = 9 Units wit 1 Pro Dealers and 1 Casino Mgr. = 7 Units wi1 Casino Mgr. =14 Units,2 Pro Dealers and 1 Casino Mgr.